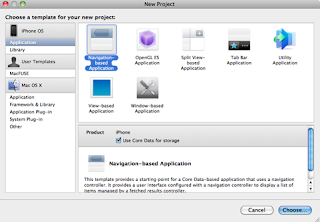 When I first started tinkering with iPhone programming I struggled for a while trying to build what I thought was a straight-forward application. 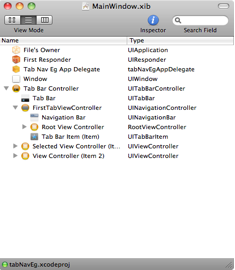 I wanted a tableView within a NavigationController withing a TabBar. 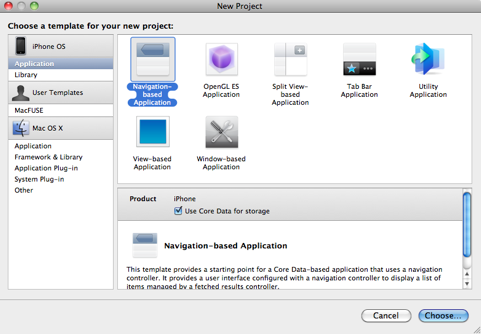 This is a very common application framework, but Apple in their infinite wisdom have chosen not to make a template for it - we have tabbed application and navigation-based application, but not a combination of the two. To make matters worse, none of the books I've used seem to use this as an example, either. Being a novice I struggled for quite a while before I got this working. The other week I was asked by @perrins if I had an example as he too was stuggling to make this work. This is obviously a common issue, so I have set about writing down the steps to create just such an application below, in the hope that it will help some others. // Created by Duncan Anderson on 08/10/2010. // Copyright __MyCompanyName__ 2010. All rights reserved.